Fossilized bones of a T. rex are displayed at the Smithsonian Museum of Natural History on Tuesday. 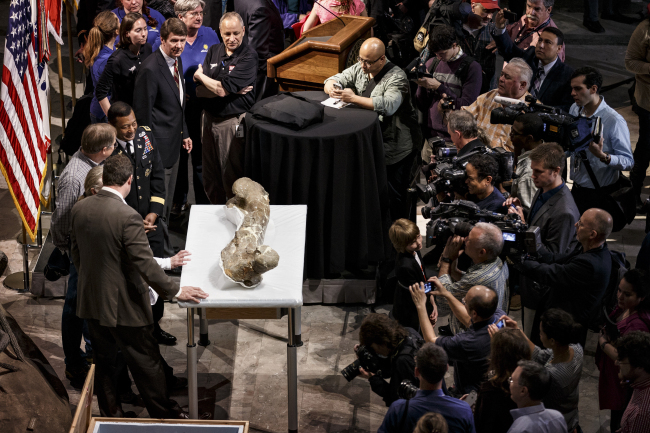 WASHINGTON (AP) ― More than 100 years after dinosaurs were first displayed on the National Mall, T. rex ― the king ― is joining the Smithsonian collection after a long journey from Montana. Paleontologists and curators unveiled parts of a nearly complete Tyrannosaurus rex skeleton Tuesday, including its jaw with teeth as big as bananas, at the National Museum of Natural History. FedEx delivered the dinosaur bones in a special truck carrying 16 carefully packed crates that were kept at room temperature for the nearly four-day trip. A large leg bone and the T. rex teeth drew “ahs” as museum director Kirk Johnson told a crowd that the skeleton ranks as one of the top five T. rex skeletons discovered because it’s about 85 percent complete. “It lay in the ground much as it had died on the shores of a stream in Montana just over 66 million years ago,” Johnson said. The T. rex, discovered in 1988 on federal land in Montana, is one of about half a dozen nearly complete T. rex skeletons that have been uncovered. This specimen could become the most prominent with its new home in one of the world’s most-visited museums. About 7 million people visit the natural history museum each year, and it offers free admission. Kathy Wankel, a Montana rancher who discovered the bones in 1998 during a camping trip, said she was proud to see the specimen in a national museum. Initially, Wankel spotted several centimeters of bone sticking out of the ground, and she and her husband dug out a small arm bone. Paleontologists from the Museum of the Rockies in Bozeman, Montana, excavated the fossil, and it’s been housed there for the past 25 years. At the Smithsonian, the skeleton will be mounted upright for the first time.